Abbie had an interesting line this week on Sleepy Hollow Season 2 Episode 16, which basically sums up what went wrong this year. A total lack of focus has forced Sleepyheads to abandon the series. The show is no longer "must watch TV." As a matter of fact, even DVR ratings prove that less than 3 million fans record the series weekly. What a damn shame; it's like Heroes all over again! Sure, we always had our monsters of the week, but the endgame was stopping the apocalypse. Two witnesses fighting evil to avoid the end of days. What the hell happened to that Sleepy Hollow? While the reavers were definitely some of the scariest creatures this season, I felt like I'd already seen this episode. It was called The Strain Season 1. Sharif Atkins' (Jones from White Collar) guest spot was probably the highlight of this week's installment for me. The guy is a fantastic actor and there were absolutely no traces of Jones visible in his performance as Calvin Riggs. Though I love Steven Weber I couldn't get Brother Michael, the character he's currently playing on Helix Season 2, out of my head. Weber kept pulling me out of the episode, which didn't help an already troubled script. Anyway, so Abbie and Crane go searching for the missing workmen in the tunnels and come across a chamber. Abbie's line was great! Throughout this episode, I kept thinking Tom Mison and Nicole Beharie are still so amazing together. Their chemistry is what hooked me in the first place, it's a shame the writers kept them apart so much this season. Jenny spotting the markings on Irving's arm was ridiculously convenient. I thought to myself, seriously that's how you're giving the game away? I did enjoy the fact that Jefferson "unfriended" Crane. Hearing him say that was hilarious. Then he mentioned Jefferson's Fenestella and since more information was required, Abbie turned to Grace Dixon's journal... as you do. It just makes little sense you know? In the tunnels, Calvin Riggs appeared and used his camera's flash to fend off the reavers; too damn convenient. Are you seeing a pattern here? Then of course, they partner up with the journalist to find his brother. Yeah the dude's still alive, he's got a son after all, unlike the poor sap munched on by the reavers. What crappy guardians those creatures turned out to be, done in by a camera flash. Inside the Fenestella, who do our heroes encounter but Jefferson himself. What?!? Of course, we quickly learn he's some kind of hologram powered by science and witchcraft. Okay a cube that harnesses supernatural energy? The writers pretty much lost me at that point. 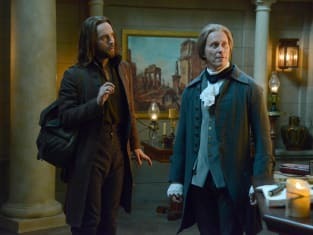 I mean, Sleepy Hollow has always been silly and a tad campy, but I've got to say "What Lies Beneath" takes the cake. I'll be honest, this week's episode almost made me want to jump ship. It's a good thing there are only two installments left. Will I tune in for Season 3? Probably not. Jefferson's Fenestella was created for the witnesses? As was the Folio Immaculata? Seriously, it's just all too ridiculous to repeat; wowza. We learned that Irving used an ancient rune to shield his curse. So he's not evil but will be soon? Damn am I confused, and I'm not sure I care. Last week, in my Sleepy Hollow Season 2 Episode 15 review, I wrote I had hope the season would finish strong. Now, I'm not so sure anymore. What did you think of "What Lies Beneath"? Did you like the Jefferson hologram? Was the episode silly, or is it just me? Your turn, hit the comments below and let me have it if you loved this week's show. Look for our Sleepy Hollow round table later this week. Remember you can watch Sleepy Hollow online right here via TV Fanatic if you need to catch up before the season finale. NOTE: Sleepy Hollow Season 2 Episode 17 will be titled "Awakening" and airs on February 16.